I love rice pilaf. It can add so much flavor to so many things. When I was younger I loved-I mean looooved-Rice A Roni. Yep, believe it. At some point I remember thinking, “there must be something better than this? !” Thank God. 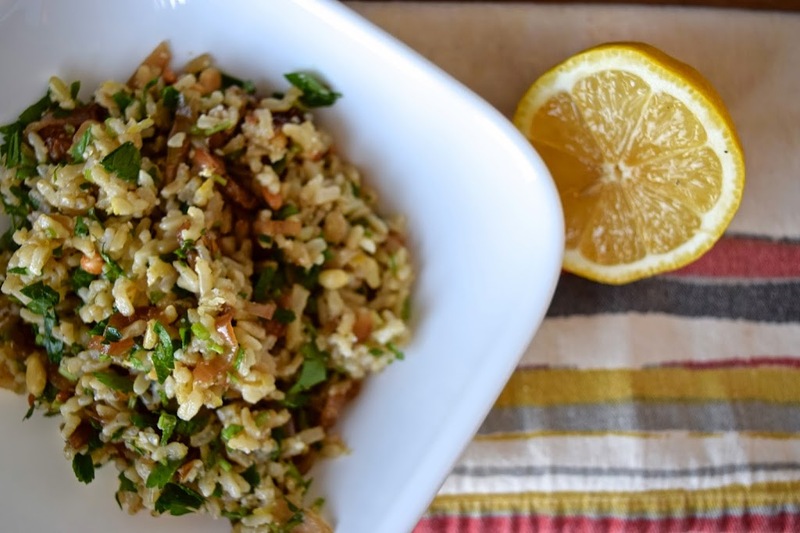 So, the rice pilaf love continues with just better versions as a chef and better flavors. New additions, yummy varieties. It’s so versatile! As the base for a bowl of roasted vegetables, as a side to a piece of beautifully cooked meat or an accompaniment to some fabulously sautéed tempeh. And it’s flexible with it’s flavor blends. Start with steamed rice, add some acid (lemon juice, white balsamic vinegar, etc. ), add some olive oil, add a toasted nut or seed, add some herbs, add some nicely sautéed green onions or shallots….the list goes on! It’s a great way to use up some rice that you may have stashed in your freezer (because you were smart and made some extra to keep on hand for something just like this!). If you happen to score some beautiful fresh fava beans, cook those babies of and toss them in! Same thing with sweet spring peas. Yum! And here we are in spring. Well, ok technically it’s spring, but it has snowed in both New York and Chicago. And I mean SNOWED. The calendar tells me it’s spring. I don’t really believe it. But I’ll keep cooking like it is! And that’s what brings me to this recipe. Lemon, chive, parsley, parmesan, toasted pine nuts and caramelized shallots all do a happy little dance together to make sure the flavor is fresh, layered and extra springtimey to bring a smile to your face. Even though you are still wearing snow boots and a parka. 2. Place rice in a medium bowl, add the caramelized shallots and any oil that remains in the pan. Add all remaining ingredients and gently fold together until combined. *to make dairy free: eliminate the parmigiana and instead add a pinch of nutritional yeast. **to make nut free: substitute toasted pumpkin or sunflower seeds for the pine nuts! Note-I prefer my pilaf at room temperature. But if you would like yours warmed you can saute the rice with the carmelized onions and then add all remaining ingredients once it is heated through. Or you may place in an oven safe container and warm with everything-except the herbs-for about 15-20 minutes. Then fold the herbs in!